The majority of the world’s sick babies urgently require breastfeeding for survival. All babies, and especially sick babies, need the protection of the International Code and subsequent WHA Resolutions so all products for these babies should be covered. The current FSMP Directive (adopted in 2000) contains none of the safeguards of the International Code of Marketing of Breastmilk Substitutes and WHA Resolutions. The lack of controls on promotional strategies such as advertising, free and low-cost samples and supplies, promotional ‘educational’ literature for parents and a plethora of health and nutrition claims, has opened the door to widespread abuse. This has created a market for specialised formulas’ of no proven value with formulas claiming to ‘cure’ or ‘solve’ all manner of normal feeding occurrences such as regurgitation and slow growth. The only safeguard is a requirement that the label states that the product must be used under medical supervision. The baby food industry has claimed that the mandatory breastfeeding statement would undermine the confidence of parents in the special diet necessary for their infants. This is false. There are very few products for which the ‘breastfeeding is best’ statement is inappropriate and where breastfeeding may be totally contraindicated, for example formulas for babies with Maple Syrup Disease (0.0005% of 129 million). Galactosaemic babies who cannot tolerate breastmilk are usually fed on lactose-free formulas. These formulas normally carry a ‘breastfeeding is best’ notice because they are used by vegans and others avoiding dairy products. Other conditions such as PKU require formulas formula without phenylalanine but these infants benefit from the addition of partial, carefully managed breastfeeding, so the ‘breastfeeding is best’ statement would not cause a problem. 2. The labeling must make it clear the product should be used under CONTINUING Medical supervision. 3. The name of the food should not be, or contain, anything which indicates or may be understood by the purchaser to be a claim of any kind or to imply a health advantage. The name should not imply that the product is like human milk. 5. 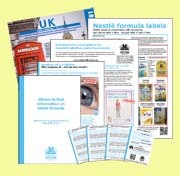 Implied health claims and disease risk reduction claims should not be permitted on any labelling for information materials.